The world of natural color around us is enhanced by the use of dyes. Color is an expression of "feeling". Color can affect our emotions. The colors we surround ourselves with create certain feelings in us and for others, especially their perception of us. Commercial enterprises place great importance on their business image. Of priority is the choice of "company colors". Colors play an important role in our economy. Colour has been investigated and used for more than 2000 years. Throughout history, different civilizations have experimented and learned more about colour. We are still learning today about how colour affects us and its importance in our lives. The ancient Egyptians have been recorded to have been using colour for cures and ailments. They worshipped the sun, knowing that without light there can be no life. They looked at nature and copied it in many aspects of their lives. The floors of their temples were often green - as the grass which then grew alongside their river, the Nile. Blue was a very important colour to the Egyptians too; the colour of the sky. They built temples for healing and used gems (crystals) through which the sunlight shone. They would have different rooms for different colours. There are lists on papyrus dating back to 1550 BC of colour "cures".Their deep knowledge and understanding of the healing powers of the colour rays was so nearly lost when, later on in history, the Greeks considered colour only as a science. Hippocrates, amongst others, abandoned the metaphysical side of colour, concentrating only on the scientific aspect. Fortunately, despite this, the knowledge and philosophy of colour was handed down through the ages by a few.The Chinese also apparently practiced Colour Healing. The Nei/ching, 2000 years old, records colour diagnoses. 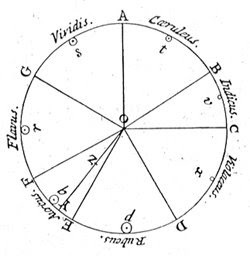 Some of the early studies and theories about light were done by Aristotle. He discovered that by mixing two colours, a third is produced. He did this with a yellow and blue piece of glass, which when brought together produced green. He also discovered that light travels in waves. Plato and Pythagoras also studied light. 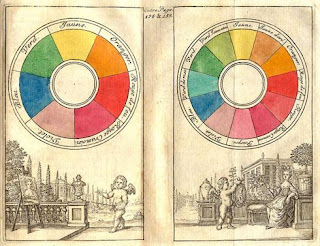 During the Middle Ages, Paracelsus reintroduced the knowledge and philosophy of colour using the power of the colour rays for healing along with music and herbs. Unfortunately, the poor man was hounded throughout Europe and ridiculed for his work. Most of his manuscripts were burnt, but now he is thought of, by many, to be one of the greatest doctors and healers of his time. A man, it would seem, very much ahead of his time. Not only do we now use Colour Therapy once again, but, his other ideas, using herbs and music in healing, can also be seen reflected in many of the complementary therapies now quite commonplace. 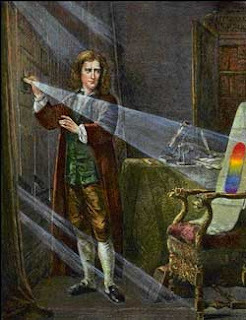 A pioneer in the field of colour, Isaac Newton in 1672, published his first, controversial paper on colour, and forty years later, his work 'Opticks'. Newton passed a beam of sunlight through a prism. When the light came out of the prism is was not white but was of seven different colours: Red, Orange, Yellow, Green, Blue, Indigo and Violet. The spreading into rays was called dispersion by Newton and he called the different coloured rays the spectrum. It is also interesting to look at the different phases in history and how those phases have been reflected in the colours generally worn at those times. During times of severity and propriety the code of dress was very much dominated by black and grey. The Victorians mainly wore black - influenced by the Queen's long period of mourning no doubt - and were, in many ways, quite austere and, it has to be said, in many ways not very colourful. The Puritans too, of course, dressed in black. This is not to say that black is a bad colour. Every colour has its positive and negative aspects. Wearing black with another colour can enhance that other colour's energy. Black can also give the space sometimes needed for reflection and inner searching. It can indicate inner strength and the possibility for change. Before the last war it was noted that a lot of red was being worn. Red in its most positive is the colour for courage, strength and pioneering spirit, all of which were much needed by the men and women who were fighting that war. However, in the most negative aspect, it is the colour of anger, violence and brutality. As the war was coming to an end, pale blue became a popular colour - an omen of the peace to come perhaps, also giving everyone the healing they must have so badly needed. Businesses are accepting that their employees may work better given a certain environment and hospitals and prisons are also becoming aware of the effect that the colour around them can have on patients and prisoners respectively. Paint companies have introduced new colour cards with the therapeutic aspects of colour in mind. Cosmetic companies too have 'colour therapy' ranges included in their products. Colour has a great deal to offer us and can be found all around us in nature. The 'colour' becomes a way of life, not just a therapy. quite interesting and informative! 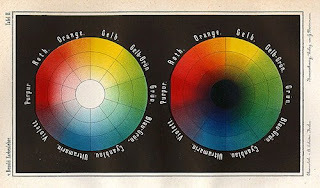 its nice to read about the significance of colour throughout history. lot of info here about sketch... hopefully you and others enjoy and happy blogging. This is all really interesting info. Totally enjoyed going through the history of colors. Good work.